X a. The assessed value is at a higher percentage of value than the assessed value of other real property on the assessment roll. ___ b. The assessed value of real property improved by a one, two or three family residence is at a higher percentage of full (market) value than the assessed value of other residential property on the assessment roll or at a higher percentage of full (market) value than the assessed value of all real property on the assessment roll. ____ a. The latest State equalization rate for the city, town or village in which the property is located is ___ %. ___ b. The latest residential assessment ratio established for the city, town or village in which the residential property is located. Enter latest residential assessment ratio only if property is improved by a one, two or three family residence ___ %. ___ c. Statement of the assessor or other local official that property has been assessed at ____%. X d. Other (explain on attached sheet). Grieving any assessment can be a painstaking task. It is often met with opposition from the assessors, Boards of Assessment Review and even Small Claims Hearing Officers. The Office of Real Property Tax Services presumes the assessor is always correct. In return, so do the Boards of Assessment Review and Hearing Officers. Contrary to that belief the assessor is not always correct. A four-step approach has been developed that will help taxpayers through the process of grieving by Unequal Assessment. The only requirements needed to be proven in grieving by Unequal Assessment are a lower estimated Market Value than the assessor or a higher percentage of value than others on the same assessment roll. The Grounds for the complaint is based on Real Property Tax Law RP-524, Part 3, Section A, 1 a or b. Comparable property information comes from the local County website that is supplied by the assessor so it is presumed to be correct and accurate. New York State & Real Property Service only requires three comparable properties or recent sales to estimate a Full Market Value or a higher percentage of value. The Comparable Property or Sale Analysis approach is recommended and approved by New York State Department of Taxation & Finance and the Office of Real Property TaxServices for the estimation of full market value and a higher percentage of value. The Estimated Full Market Value in this grievance is the average of ten comparable or recent sale properties. 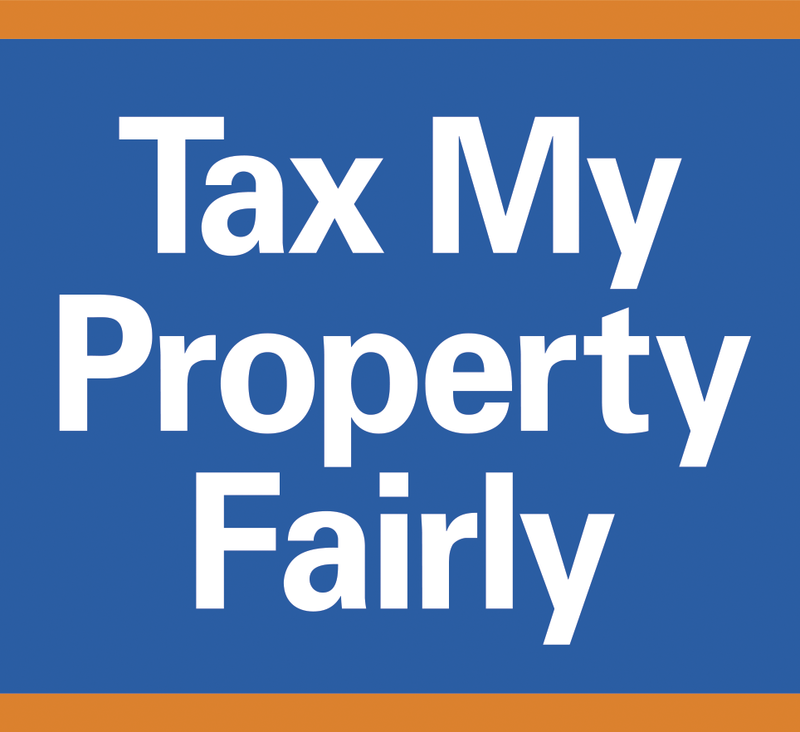 Three times more than required by Real Property Tax Law. The estimated values used for property comparisons are more accurate and extensive than required by Real Property Tax Service and NYS. This approach is not a guarantee that a taxpayer will receive a reduction in an assessment. However, if the information is presented properly to a fair assessor, it should go no further than the Informal Meeting. Although New York State Taxation & Finance and the Office of Real Property Tax Services recommends only three "recent sale" properties for comparison purposes, those sales at times may not have occurred or may not be available. It is important to note that New York State Law requires each property identification to have the estimated full market value listed on the website, tax roll and tax bill. If these properties are listed at full market value by the assessor and the assessor is always presumed to be correct, there is no legal reason why these properties can not be used for comparison purposes, just as recent sales. Many county websites have Image Mate which will allow a taxpayer to access the Property Identifications of other taxpayers within the same town or village. When obtaining comparable properties be sure they are all on the same tax roll. Comparable properties should be similar to the one being grieved, however they do not need to be exact. Obtain at least ten comparable properties and print the entire file on each property plus the file on the property being grieved. Information on the websites are supplied by the local assessor so they also must be presumed to be correct. Make copies of all the information related to the comparison properties to back up the information written on the Comparable Analysis Chart. New York State Department of Taxation & Finance along with the Office of Real Property Tax Services has a recommended approach of comparing properties to estimate the full market value of the grieving property. These are the questions and answers provided by New York State for this approach. Local assessors’ offices - They should be able to provide the sales history of a particular house, neighborhood, or style of architecture. Some assessors also provide lists of recent sales that you can browse and compare to the assessment roll. Municipalities - Some choose to provide local sales in their offices or online. Online Databases - Search for them using keywords such as "comparable home sales" or "comparable sales". In addition, you may wish to try searching "real estate database - New York State" for additional property information. Local newspapers - These are good sources of real estate information. 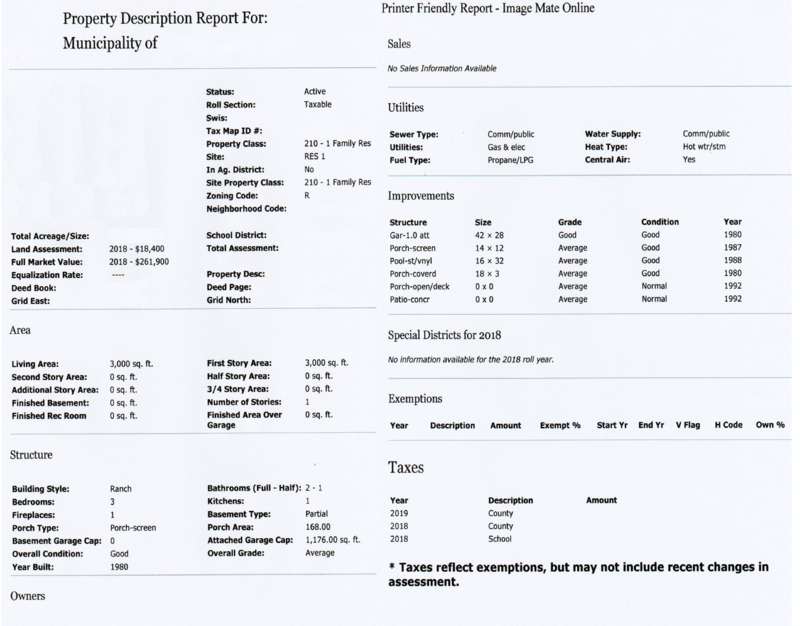 They often have quarterly sales reports in the real estate or business sections. Real Estate Agents - They may be willing to share their expertise and sales history information. Why should I estimate my home's market value? Establishing your home's market value gives you greater control over your property taxes, insurance premiums, and the sale or refinancing of your home. Many people hire professional appraisers to estimate their home's market value. However, there's no reason why you can't do it yourself by following a few simple steps outlined below. 1. External characteristics - "curb appeal", home conditions, lot size, popularity of an architectural style of property. water/sewage systems, sidewalk, paved road, etc. 2. Internal characteristics - size and number of rooms, construction quality, appliance condition, demonstrated "pride of ownership," heating type, energy efficiency, etc. 3. Supply and demand - the number of homes for sale versus the number of buyers, how quickly the homes in your area sell. 4. Location - desirability for a particular school district, neighborhood, etc. How do I estimate my home's market value? 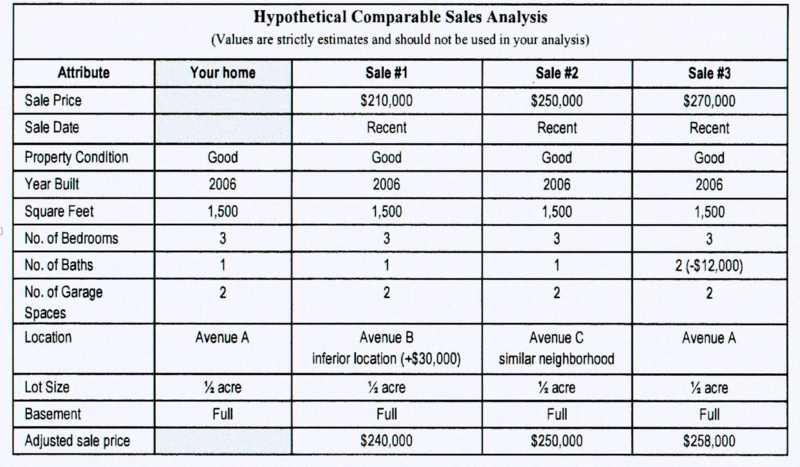 NYS recommends you use the sales comparison approach to estimate your home's market value. This is the primary method used by professional appraisers and real estate agents to determine the market value of homes. Begin by researching recent sales of similar properties in the local area. The sale prices of these properties will provide a good place to start with in estimating your home's value. Try to find sales of at least three properties that are comparable to your home. If possible, make sure these properties were sold under normal conditions. You only want properties sold at market value. Look for these characteristics in determining whether the sold property is comparable: lot size, square footage, home style, age, location. NYS suggests you create a grid like the one shown here to help you compare all of the properties. Let's say your home is a 1,500 square feet ranch with 3 bedrooms, 1 bathroom, full basement and two-car garage on a 1/2 acre of land. It was built six years ago in a nice neighborhood. After doing some research, you find three comparable properties recently sold at market value. However, not all of the characteristics matchup. Sale #1 is in a less desirable (or inferior) location and Sale #3 has an additional bath. Sale #2, though, is almost identical to your home. Since Sale #1 and Sale #3 aren't identical to your home, you must compensate for these differences by adjusting the sale price of each property. To do this, you have to guess what the property would have sold for if the property had the same characteristics as your own. Since you already have the sale price as a baseline, you only have to estimate the value of the differing characteristics. For instance, you can safety assume that Sale #1 would have sold at a higher price if it was located in your neighborhood, which is the nicer one between the two. You then estimate that the increase in value would be around $30,000. The adjusted sale price for Sale #1 is thus the sale price plus $30,000. Next, you move onto Sale #3 and determine that not having the extra bath would decrease the sale price by about $12,000. Because Sale #2 is almost identical to your property, no adjustments are necessary. Now you have three sale prices that can be used as a rough estimate of your home's market value. A Comparable Sales Analysis Adjustment Formula has been developed to assist in making adjustments between the property being grieved and the comparison property. The formula has more items for comparison and abetter average cost than shown by the New York State Department of Taxation & Finance and the Office of Real Property Tax Services. This can be found on a tax bill, County website or from the assessor. It is the amount the assessor believes a property would sell for under normal selling conditions. ‍This is the difference between the grievance property and the comparable property. If the comparable property is older than the grieving property, add the value to the comparable property. If the comparable property is newer than the grieving property subtract the value from the grieving property. Example: Assessed amount $150,000.00 divided by 1200 square feet = $125.00 per square foot. Difference in square feet between the two properties is 250. Multiply 250x $125.00 = $31,500.00 Add or subtract this amount from the comparable property. ‍There is no adjustment here. The amount of bedrooms is already figured in to the square footage of the residence. Any adjustment here would be double dipping. ‍Only adjustments here would be for fixtures such as tubs, showers, vanities, whirlpools, toilets etc. All other adjustments such as square footage isalready figured in. If the comparable residence has more bathrooms than the grieving residence then subtract the difference from the comparable residence.If the comparable residence has less than the grieving residence then add the difference to the comparable residence. Look closely to see if there may be an in-law apartment included in the comparable residence. Many times a second kitchen may be listed that goes unnoticed. This would include additional cabinets, counter tops etc. If the comparable property has more than the grieving residence then subtract that amount from the comparable residence. If the comparable residence has less than the grieving residence then add that amount to the comparable residence. ‍Fireplaces have a wide range of values. The best way to estimate a value of a fireplace is on the assessed value of the comparable residence. If the comparable residence has more than the grieving residence then subtract that amount from the comparable residence. If the comparable residence has less than the grieving residence than add that amount to the comparable residence. Basement - There are many classifications for basements. The amounts used here are for what it may cost to build each classification from a slab or pier. If the comparable residence has a higher value basement (full) than the grieving residence(partial) then subtract the appropriate amount from the comparable residence. If the comparable residence has a lower value basement (partial) to the grievance residence (finished) then add the appropriate amount to the comparable residence. ‍To find information on a property's individual garages and barns, enter the property's identification number on the County Real Property Tax Data and look under improvements or additional inventory. Descriptions are generally vague at best. If the comparable property has more barns or garages than the grieving property then subtract the appropriate amount from the comparable property. If the comparable property has less barns or garages then add the appropriate amount to the comparable property. Only in-ground pools are assessable. In ground pools can vary greatly depending on size and landscaping. Three classifications can be made here to help in the adjustment process. Satellite imagery is the best way to see the type of pool without actually going onto the property. Location makes a difference with Market Value from taxing jurisdiction to taxing jurisdiction. Always try to have comparable properties that are in the same taxing jurisdiction as the grieving property. It is often said a comparison property from a village to one that is in the country can not be used. Just as many people like the country as a village so that is not a valid reason for denial of a comparable property. ‍The amount of acreage can always be adjusted for comparable use. The base amount is that of the grieving property. If the value of the comparable property is higher than the base amount of the grieving property, then subtract the higher amount from the comparable property. If the value of the base amount is lower than the grieving property then add that amount to the comparable property. If the grieving property has lakefront try to have all the comparable properties also to have lakefront. It can be done but it is hard to estimate the impact that certain lakefront properties can have when comparing to properties without lakefront. This is used by some assessors and not by others. An effective year built is the actual date that is used for assessment. A house that was built in 1920 but was completely remodeled in 2010 could have an effective year built as 2010. Always use the effective year built if available for comparison purposes. Any assessor that does not use an effective year built only creates more unequal assessments in the tax roll. Once the adjustments are completed in every category, an estimation of what each comparison property could sell for with all items being equal to the grievance property can be made. Beginning with the Fair Market Value the assessor has established for a comparable property, add or subtract the adjustments until a new total is made. This is called the adjusted sale price. Do this for each comparison property. Take all of the new totals and add them together. Divide this number by the total number of comparison properties. This is the grievance property's owners new estimated average market value when equally compared to the other properties on the same assessment roll. ‍Once the grievance property owner has established a new estimated average market value, the percentage of value can be obtained. The higher percentage of value is the difference between what the grievance property owner is assessed by the assessor and the average assessment of the comparison properties used by the grievance property owner after making adjustments in the criteria to make each property virtually the same. This is done by taking the assessor's Fair Market Value and subtracting the grievance property owner's new estimated average Fair Market Value. This number is then divided by the assessor's Fair Market Value and multiplied by 100. This is a sample of a completed Comparable Property Analysis chart. This same approach can be made using recent sale comparison properties. Instead of using the Assessed Fair Market Value, use the recent sale price. With a completed chart, an estimated Full Market Value for the grievance property can now be determined. To do this, add all of the Adjusted Sale Prices of the comparison properties together. 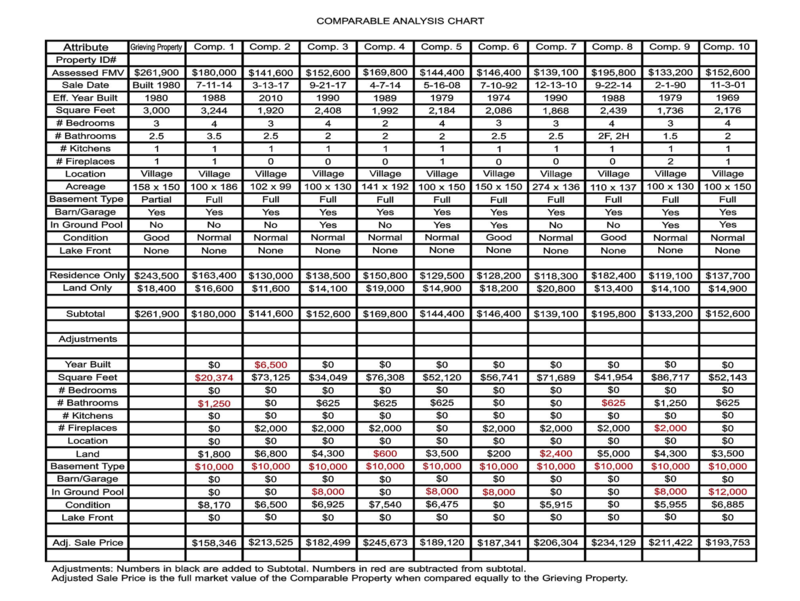 In this example the total of the ten comparison properties is $2,022,112.00. Divide this number by the number of comparison properties (in this case it is 10) and the total is $202,211.20. This is the new estimated Full Market Value for the grievance property after adjustments for differences have been made. The assessor's Full Market Value of the property being grieved is $261,900.00. In this example the taxpayer can claim an Unequal Assessment in the amount of $59,688.80 when compared to other properties on the same assessment roll. Requirement number one has now been proven with an estimated Full Market Value of $202,211.20. Requirement number two is a higher percentage o f value. This is established by taking the difference between what the grievance property is assessed by the assessor ($261,900.00) and the average assessment of the comparison properties ($202,211.20) which is the amount of $59,688.80. Next the $59,688.80 is divided by the assessor's assessment of $261,900.00 equaling an amount of .2279. The .2279 is multiplied by 100 which gives a higher percentage of value of 22.79%. Both requirements have now been proven. An UnequalAssessment of $59,688.80 and a higher percentage of value of 22.79%. Clearly state and print on the cover page of your grievance your estimated Market Value and Higher Percentage of Value. Although all the requirements have been proven it is still no guarantee the taxpayer will receive the reduction they deserve. If denied it will be because it is the personal opinion of the assessor, Board of Assessment Review or Hearing Officer, not the facts or Real Property Tax Law. Assessor's, Boards of Assessment Review and Hearing Officers can come up with amazing excuses to deny a property owner a reduction. · "I believe you can sell it for what it is assessed for"
· "you paid that much for it so that is the best indicator of the Full Market Value". · "If you had an appraisal, it would be easier". 1. Generally, if assessments in your city, town or village are not made at full value, State law requires that they be made at a uniform percentage of value. If you believe that your property is assessed at a higher percentage of value than the average of all other properties on the same assessment roll, you may claim an unequal assessment. 2. If you own a one, two or three family residence and if you believe that it is assessed at either a higher proportion of full (market) value than other residential property on the assessment roll or at a higher proportion of full (market) value than the assessed valuation of all real property on the assessment roll, you may claim an unequal assessment. · What the assessor believes you can sell your property for is only a personal opinion, not facts. · What you paid for the property is only one of many indicators that determine market value. An assessment can not be made on a sole indicator. · New York State Department of Taxation & Finance and the Office of Real Property Tax Services state there is no reason for a taxpayer to hire a professional appraiser. They (NYS) show you how to do it yourself. In the case of one, two or three family residential real property, you also have the option of proving that the percentage of full value represented by your assessment is higher than the average percentage at which other residential properties are assessed on the same assessment roll. To establish the average percentage at which residential property is assessed on the assessment roll, the latest residential assessment ratio established for your assessing unit is useful. (The residential assessment ratio is available from your Assessor, County Clerk or County Director of Real Property Tax Services, or the Office of Real Property Tax Services.) Once you have established the average percentage at which other residential properties are assessed, you must apply this percentage to the value of your property. If the result is lower than your assessment, you may request that your assessment be reduced to that lower amount. * Residential Assessment Ratio (RAR): The Residential Assessment Ratio (RAR) is an indication of the level of assessment for residential real property in a municipality. It is a measurement of the overall ratio of the total assessed value of residential property in the municipality compared to the full market value of that residential property. The RAR (Residential Assessment Ratio) can be used by homeowners in a Board of Assessment Review (BAR) grievance and in a Small Claims Assessment Review (SCAR) hearing. The assessor determines the (LOA) Level of Assessment for their assessing unit. The Level of Assessment is the overall percentage of market value at which properties are assessed within a community. Sixty days prior to the filing of the Tentative Assessment Roll of an assessing unit, the Commissioner shall determine the (RAR) Residential Assessment Ratio for such assessing unit. The Residential Assessment Ratio shall be equal to the Level Of Assessment of residential property in the assessing unit as determined in the market value survey used or to be used to calculate the state Equalization Rate for that assessment roll. Below are Real Property Tax Laws that support grieving by Unequal Assessment. · RP-524 Grievance Form. Part Three: Grounds for Complaint, A. Unequal Assessment 1a: "The assessed value is at a higher percentage of value than the assessed value of other real property on the assessment roll." · RP-522 Unequal assessment. "Unequal assessment" or an assessment which is unequal shall mean and include: (c) "an entry on an assessment roll of the assessed valuation of real property improved by a one, two or three family residence which is made at either a higher proportion of full value than the assessed valuation of other residential property on the same roll by the same officers". "Unlike situations where judicial review is sought under RPTL, Article 7, there is no statutory or judicial authority which touches on the issue of whether a complainant before a board of assessment review may submit the assessments of comparable properties as proof of inequality. Absent a specific prohibition, we believe a complainant is entitled to do so, even though there is the distinct possibility that the comparable properties selected by the complainant will be assessed at a percentage of value below the average level of assessment". Now the taxpayer has an approved approach that is recommended by New York State Department of Taxation & Finance and the Office of Real Property Tax Services. If done correctly, it is extremely hard for assessor's, Boards of Assessment Review or Hearing Officers to ignore and deny the grievance. New York State recommends only three comparison properties to prove an estimated market value, following this approach with ten comparison properties is three times more likely to provide a more accurate market value and higher percentage of value than required.